KUALA LUMPUR – Almost 10 months after security forces forcibly broke-up an electoral reform protest in the national capital, a chaotic repeat looms as the Malaysian government and city authorities attempt to close off the city center square where activists hope 100,000 people will gather this weekend to seek sweeping changes to the country’s electoral system. The rally organizers, known as Bersih (Malay for ‘clean’) 3.0, are a coalition of nongovernmental organizations and rights groups who say they want Malaysia’s electoral laws amended. Opposition MPs allege that tens of thousands of irregularities persist on the electoral register, while Bersih’s calls for the election commission to resign will have acquired added momentum by allegations Friday that the EC head and deputy head failed to disclose past membership of the governing party . The rally is being held ahead of anticipated snap polls later this year. During a Bersih rally last July 9, over 1,600 people were arrested and scores injured, including opposition leader Anwar Ibrahim. 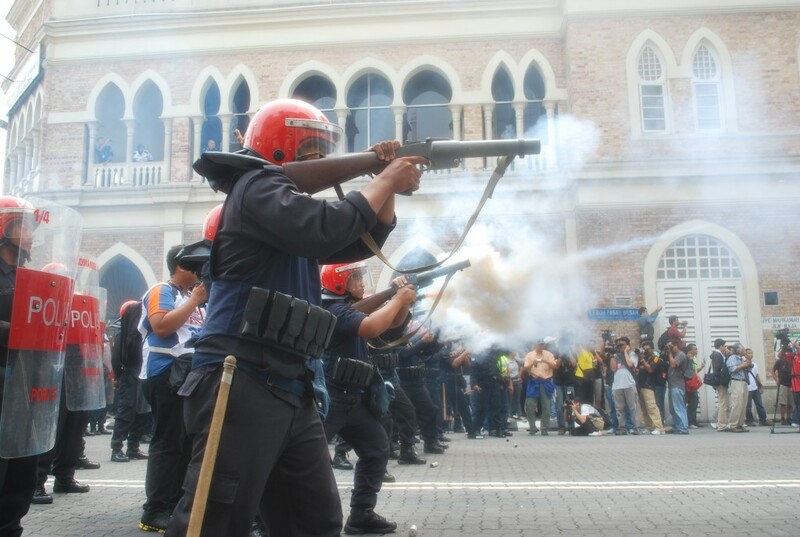 Police fired tear gas and water cannon at tens of thousands of peaceful protestors at various locations in Kuala Lumpur. The crack down hit Prime Minister Najib Razak’s reform credentials and signaled his United Malays Nasional Organization (UMNO) party’s resistance to meaningful electoral reform before the next polls, which must be held by April 2013. The stage is set for new clashes. Kuala Lumpur mayor Ahmad Fuad Ismail announced Thursday that Dataran Merdeka, or Independence Square, will be closed from 6am Friday to 6am Sunday after home affairs minister Hishammuddin Hussein said that protestors refused offers that four stadia elsewhere in the city could be used instead for the rally. As central parts of Kuala Lumpur looked set to go into the same sort of eerie eve-of-rally zombie flick-style lockdown seen last July, the government’s move was being seen as a test of Bersih’s resolve. “Merdeka Square is a matter of principle – backing down at the last minute will obviously cause confusion and also a loss of momentum,” said Greg Lopez of Australian National University. The rally comes almost a month after the Malaysian government proposed 22 electoral reforms that Bersih considers insufficient. Political analysts believe Saturday’s rally could take place less than six weeks before parliamentary elections held on June 5. Gabriel said “only the issue of indelible ink has been addressed” (which would prevent voters from casting a ballot multiple times) in the proposed electoral changes. She and other Bersih leaders advocate that an election not be held until the latest possible date, allowing the government sufficient time to pass and implement more substantive reforms into law. Beginning in September 2011, Najib’s government announced a series of reforms, including of the country’s repressive print media codes and notorious Internal Security Act (ISA) that allowed for indefinite detention without trial. The changes “underline my commitment to making Malaysia a modern, progressive democracy that can be proud to take its place at the top table of international leadership”, said Najib, speaking on the eve of celebrations marking the founding of the modern Malaysian state in 1963. However, opposition MP Dzulkefly Ahmad of the Pan Malaysian Islamic Party (PAS) dismisses Najib’s recent reform drive. “What the big print gives the small print takes away,” he told AToL, suggesting that the reform announcements were more about electioneering than substantive change. Analysts believe that a big turnout on Saturday could influence whether the government calls the elections soon. If the lockdown succeeds in keeping supporters away from the rally, a low turnout could give the impression of a waning desire for political change and thereby spur the government into holding an early snap poll. Under current election laws, the government only needs to give a week’s notice before holding an election, giving the opposition little time to prepare a nationwide campaign. The UMNO-dominated Barisan Nasional (BN, or National Front) ruling coalition has governed Malaysia since independence, though the current opposition coalition led by Anwar Ibrahim, a former UMNO insider, achieved its best-ever result in 2008, denting the government’s two-thirds parliamentary majority for the first time in the multi-ethnic, multi-religious state. Around 60% of Malaysians are either ethnic Malay or other ‘indigenous’ groups and are mostly listed as Muslim. Another 25% are ethnic Chinese and 7% mostly Tamil-speaking Indian-Malaysians. Party and voting allegiances have not traditionally been cast on strict ethnic lines, however, with UMNO and PAS competing for the ‘Islamic’ vote and with separate Chinese-dominated parties in both the BN and opposition coalitions. On Friday, government-linked media played up opposition senator Tunku Abdul Aziz’s description of Bersih as “irresponsible” for refusing to back down on the rally venue. The Democratic Action Party (DAP) representative’s comments highlighted that despite government claims Bersih and the parliamentary opposition are not locked in a seamless alliance. Indeed, the opposition Pakatan Rakyat (People’s Alliance) coalition itself is an unwieldy amalgam of Anwar’s centrist Keadilan party, the secular Malaysian-Chinese DAP and the sharia law-favoring PAS, whose divergent interests are perhaps only held together by the prospect of displacing BN from power. Looking ahead to eventual elections, academic Yang Razali Kassin of the S Rajaratnam School of International Studies (RSIS) at Singapore’s Nanyang Technological University said that BN would go all out to win back its previously held two-thirds majority and the four out of 13 federal states lost to the opposition in 2008. “In that sense the opposition will be on the defensive,” he said. The prime minister’s popularity has jumped after recent hikes to civil service salaries, one-off cash transfers to low-income families and recent reform announcements. For now, political analysts feel that the governing parties are well placed to win any upcoming election. “The real issue is how big will BN win,” says academic Lopez, adding that the opposition has failed to make inroads into the government’s voter-heavy stronghold of east Malaysia, where the election could be won or lost. After the negative response to last July’s crackdown on the Bersih 2.0 rally, analysts believe it would be counter-productive and counter-intuitive for the government to back a similar crackdown on Saturday. However, home affairs minister Hussein was by early Friday speaking of the proposed rally as a security issue, hinting that a repeat of last July’s crackdown is on the cards if Bersih tries to access the Independence Square. 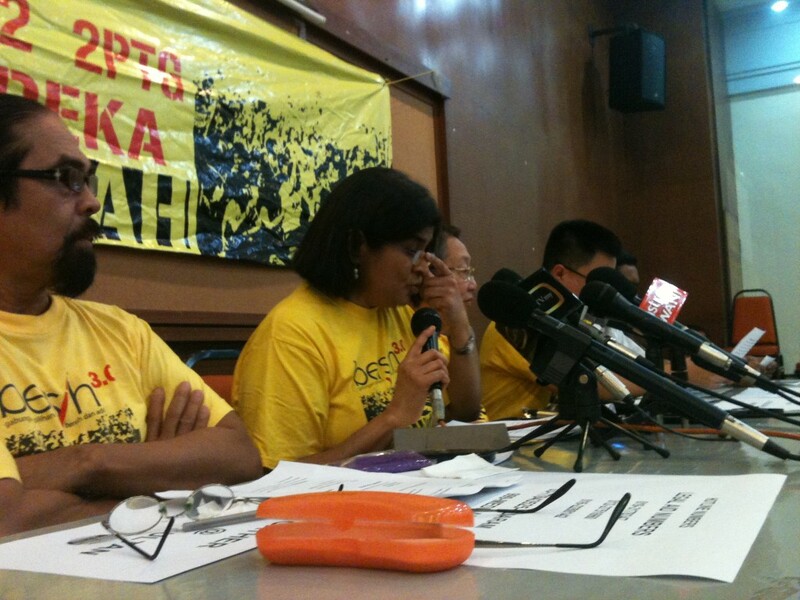 On Friday afternoon another Kuala Lumpur street confrontation loomed, as Ambiga Sreenavasan told media that she received a court order earlier that day, telling Bersih that the Dataran Merdeka would remain blocked off. But she said that the rally would go ahead nonetheless and that protestors would walk toward the square. “We hope to persuade the authorities to lift the barriers,” she said, reckoning the government’s obduracy would add 20,000 people to the protestor ranks.